As the partial government shutdown continues, Senate Republicans have introduced a package of four bills that concern American foreign policy in the Middle East. The legislation includes measures that strengthen America's strategic relationships with Israel and Jordan, that impose sanctions on the regime of Syrian President Bashar al-Assad for its atrocities during the Syrian conflict, and that combat the Boycott, Divestment, and Sanctions (BDS) movement against Israel. The package, which congressional insiders described to the Washington Free Beacon as a "mega" pro-Israel bill, should pass easily—after all, it received broad bipartisan support in previous congresses and advances American interests in a dangerous region. That is not the case, however. Times have changed for the worst. Supporting the Jewish state, a moral and strategic ally of the U.S., and especially countering the BDS movement, is offensive and unconstitutional to progressives. "It's absurd that the first bill during the shutdown is legislation which punishes Americans who exercise their constitutional right to engage in political activity," Sen. Bernie Sanders (I., Vt.) said in a tweet, including a link to a news article on the legislation. "Democrats must block consideration of any bills that don't reopen the government. Let's get our priorities right." Sanders was referring to a provision of the bill that gives state and local governments across the U.S. more flexibility to limit their own business relationships with entities that support the BDS movement. "In effect," said Senate Majority Leader Mitch McConnell (R., Ky.), "this provision allows jurisdictions to ‘boycott the boycotters,' and make sure they don't send taxpayer dollars to companies who embrace this anti-Israel posture." Supporting Sanders' tweet, first-term Rep. Rashida Tlaib (D., Mich.), a Palestinian-American, invoked an anti-Semitic canard, saying that people who support measures to penalize boycotters of Israel "forgot what country they represent." For millennia, anti-Semites have accused Jews of dual loyalty. For the past several decades, this attack has taken the form of accusing Jews outside of Israel of putting the Jewish state's interests above those of their own country. "This is the U.S. where boycotting is a right & part of our historical fight for freedom & equality," Tlaib added. "Maybe a refresher on our U.S. Constitution is in order, then get back to opening up our government instead of taking our rights away." No wonder more centrist Democrats, such as Sens. Chris Van Hollen (Md.) and Ben Cardin (Md. ), have opposed a vote on the pro-Israel legislation. Sources told the Free Beacon that Democratic leaders fear putting their newly elected members' positions on Israel on the record, "particularly in light of a newfound support in Congress for the Israel boycott movement." Sanders, Tlaib, and other like-minded progressives are either too ignorant or too dishonest to acknowledge what the BDS movement is: nothing less than a form of economic warfare against Israel meant to destroy the Jewish state. Read or listen to any prominent BDS supporter and this truth becomes painfully obvious. They may not always advocate Israel's destruction through force like, for example, Hamas, the Palestinian terrorist organization that so many progressives and BDS supporters admire for their "resistance" against Israel. 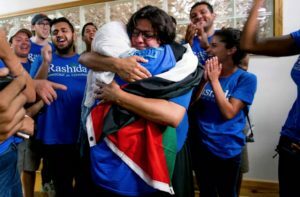 But through BDS, people like Tlaib, who do not believe in Israel's right to exist as a Jewish state, seek to undermine Israel to the point that it effectively ceases to continue as we have come to recognize it, despite—or perhaps because of—the implications for Israeli Jews, who live in a region in which most governments have shown no qualms about slaughtering Jews, or watching them be slaughtered by others. Opposing the BDS movement is a moral imperative, but it is also smart national-security policy, combatting hostile efforts to attack an ally. It is easy to dismiss Tlaib as an over-zealous freshmen member of Congress who has no real influence. One can even dismiss Sanders as just one senator who does not reflect the views of the Democratic Party's leadership. Why get too hung up on what they say about Israel? The problem is that their voices are the loudest in the Democratic Party, and while they may not be the most influential yet, they will be soon. The party's progressive base, which almost carried Sanders to a presidential nomination in 2016, is only gaining more control of the political left in America, and its hatred of so-called establishment Democrats, like Senate Minority Leader Chuck Schumer (D., N.Y.), continues to grow. Before we know it, the Democratic Party may turn into the United Kingdom's Labour Party, which, under the leadership of the ultra-progressive Jeremy Corbyn, has institutionalized anti-Semitism and deep hatred of Israel—the two always come together. That is why British Jews, generally members of the Labour Party, have become genuinely fearful about their situation. It would be unwise to think that the same thing could not happen in the United States.